The popular Premier Boxing Champions series closed out the month of July with three intriguing bouts across two nights and three different networks in the United States. The first of the three main events took place on July 29th at the Videotron Centre in Québec City, Quebec, Canada where WBC Light-Heavyweight world champion Adonis Stevenson made the seventh defense of his world title against WBC number eight rated contender Thomas Williams Jr. in a bout televised by Spike TV. In previewing this fight, this observer stated that it would be interesting to see how the champion would approach the fight against Williams, who came into the fight off of an impressive second round knockout over Edwin Rodriguez in April of this year. Stevenson has earned a reputation as a “Knockout Artist”, who has the ability to both end a fight very quickly, or gradually break down an opponent over the course of a long fight. It also interested me to see how the challenger would respond to Stevenson’s power once the champion found a way to connect with his offense. Williams would answer that question in the first round as he was knocked down by a straight left hand from the champion. Despite being dropped in a scenario where some of Stevenson’s previous opponents have resigned and have gone into survival mode before being stopped by the champion, Williams would show his mettle by getting up from the knockdown and would go on to provide the champion with what some might say was a sturdy test. Williams would not only show the ability to keep his composure after being knocked down, but would respond by periodically dishing out offense to Stevenson and even occasionally backing the champion up by being the aggressor. The challenger clearly showed that he had come to fight and was not going to go quietly against a champion who had nearly dominated every opponent in his previous championship fights. What impressed me about Williams’ offense in this fight was how he was able to not only back the champion up, but also how almost all of his offense was thrown in combination, which seemed to make Stevenson uncomfortable. The challenger seemed to have an edge when he was able to keep the fight in close where Stevenson was not able to control distance where the combat would be more to his advantage. To his credit however, the champion was able to take what the challenger threw at him and return offense. After three rounds, this was clearly shaping up to be one of the more competitive and entertaining fights in Adonis Stevenson’s reign as a Light-Heavyweight world champion. The spirited battle however, would come to a sudden conclusion in the fourth round. 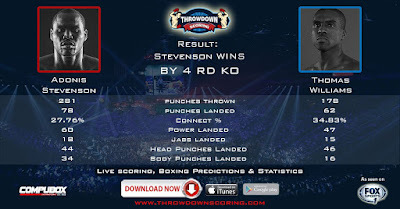 After landing some effective body punches throughout the round, Stevenson would end Williams’ evening when he landed a short, but flush left hook on the jaw of the challenger sending him down and out on the canvas in the closing seconds of round four. It was a knockout certainly worthy of Knockout Of The Year consideration, but it was more importantly an entertaining slugfest between one of the two top Light-Heavyweight’s in the world and a very “Game” challenger that more than showed his mettle in defeat. 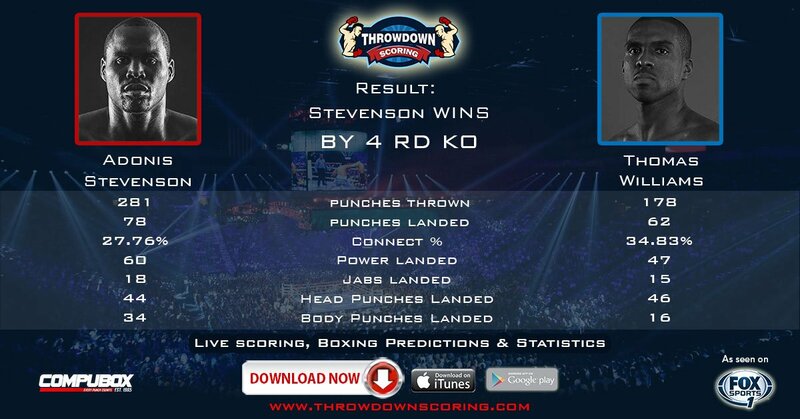 A statistical breakdown of this fight as shown and provided by ThrowdownScoring.com/CompuBox shows that this fight was the definition of a “Shootout.” Stevenson out threw Williams by 103 punches, but in total punches landed the two fighters were nearly even as the champion narrowly edged the challenger out landing him by sixteen punches out landing Williams 78 to 62. In all truth and honesty, this is a fight where although a clear winner emerged after scoring two knockdowns during the course of the bout, there could be an interest at some point down the line in a rematch between Stevenson and Williams. Williams certainly made an excellent account of himself and if he can find a way to bounce back from this loss and stay in title contention, it should not be out of the realm of possibility that a rematch between the two might happen at some point. As for what’s next for Stevenson, it appears logical that he will fight undefeated WBC number one contender Eleider Alvarez, who scored a ten round unanimous decision over Robert Berridge on the undercard of Stevenson’s KO of Williams, perhaps as soon as later this year. In this observer’s eyes the winner of the potential Stevenson-Alvarez fight should then be put into position to face the winner of a potential clash between undefeated WBO/IBF/WBA Light-Heavyweight world champion Sergey Kovalev and undefeated former Super-Middleweight world champion Andre Ward for a fight sometime in 2017. As for now the Boxing world will focus it’s attention on Andre Ward’s fight coming up this weekend against Alexander Brand. If Ward is successful, he will challenge Kovalev for the unified Light-Heavyweight world championship in November. The second of three PBC main events that closed out the month of July took place in the same venue as the third main event on July 30th as former two-division world champion Paul Malignaggi thoroughly dominated Welterweight contender Gabriel Bracero over the course of ten rounds at the Barclays Center in Brooklyn, NY in a fight that was televised by Showtime’s sister channel Showtime Extreme in the United States. Malignaggi, who was fighting for the first time since winning the European Welterweight championship with a twelve round unanimous decision over Antonio Moscatiello last December, used his footwork as well as a consistent jab to outbox Bracero in a fight that should put Malignaggi back in the mix in the talent stacked 147lb. Welterweight division. Although Malignaggi has lost some fights over the course of his career to the likes of Miguel Cotto, Ricky Hatton, Amir Khan, Shawn Porter, and Danny Garcia, he is a fighter with a high Boxing IQ and has always been willing to face the best fighters in whenever division he has competed in. This observer has stated in the past that although some Boxing fans may not appreciate Malignaggi’s skill, he does deserve recognition as a former two-division world champion. For Malignaggi, the victory over Bracero was his third win in a row since returning to the ring in September of last year following being stopped in nine rounds by Garcia in August of last year. Even though following the loss to Garcia Malignaggi stated that he would probably not fight again, it is clear that the thirty-five year old still has more fight left in him and it will be interesting to see if he can work his way back into world championship contention. The third and some might argue most anticipated main event that took place last weekend as part of the Premier Boxing Champions series was the highly anticipated battle between undefeated world champions Leo Santa Cruz and Carl Frampton for Santa Cruz’ WBA World Featherweight championship that was televised by Showtime. This was a fight that pitted two boxer/punchers against one another. Santa Cruz the unbeaten three-division world champion, who was making his second defense of the WBA Featherweight world championship going against the also unbeaten Carl Frampton, the Jr. Featherweight world champion who was moving up in weight to challenge Santa Cruz for his crown. This was in this observer’s eyes a “Toss Up.” Both fighters have a good mix of hand speed and punching power and it just seemed like an evenly matched bout between two of the best fighters in the sport. When it comes to bouts that seem evenly matched on paper prior to a fight taking place, it always interests me particularly in a fight between two boxer/punchers to see which fighter will take the initiative early on and try to dictate the combat. Both fighters appeared intent on establishing the pace the fight from the outset as both champion and challenger were able to have periods of effectiveness and each landed some combinations in the early rounds. Frampton however, would stagger Santa Cruz in the second round with a counter left hook to the head that began to shift the momentum in his favor. Although both fighters threw their punches in volume throughout this fight, the main difference particularly in the first half of the fight, was Frampton’s lateral movement as well as his accuracy with his offense that gave him a slight edge on my scorecard. As both fighters continued to have their share of moments as the fight progressed, Santa Cruz appeared to gain a slight edge in the second half of the bout. When it comes to close fights as this observer is often said over the years, it will often boil down to what a judge prefers in their own individual criteria in how they score based on clean punching, effective aggressiveness, ring generalship, and defense. Frankly, there was not much to separate the two fighters in my opinion as at the end of twelve exciting and competitive rounds I had the fight scored even on my unofficial scorecard 6-6 in rounds or 114-114 in points, the scene scorecard as official judge Guido Cavalleri. The two other official judges however, Judge Frank Lombardi and Judge Tom Schreck turned in scores of 116-112 (8-4 in rounds) and 117-111 (9-3 in rounds) in favor of Carl Frampton giving him the victory and his second world title in as many weight classes by majority decision. Although Judges Lombardi and Schreck saw this fight more convincingly in favor of Frampton than this observer did, it was a fight where there really was no loser as both fighters gave everything they had and left it all in the ring in what is surely a candidate for 2016 Fight Of The Year honors. In my eyes, I believe that the two scorecards that earned Carl Frampton the victory in this fight may have largely been based on his accuracy and lateral movement throughout the entire fight, despite both fighters having their share of moments and seemingly taking turns getting the better of exchanges as the fight progressed. 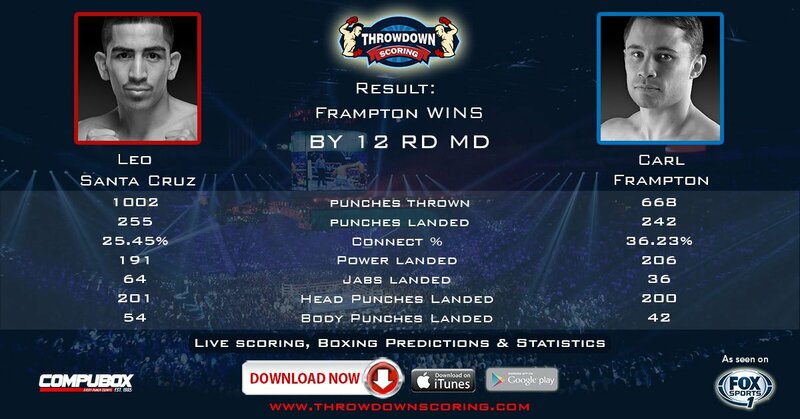 A statistical illustration as shown and provided by ThrowdownScoring.com/CompuBox indicates just how action-packed this fight was and how difficult it was to score the fight. Leo Santa Cruz out threw Carl Frampton by an incredible 334 punches throwing a total of 1002 punches over the course of the twelve round championship bout to Frampton’s 668 total punches thrown. Although Santa Cruz also out landed Frampton by thirteen punches, Frampton had a significant edge in terms of his connect percentage landing at over 36% to Santa Cruz’ 25%. If one looks for a statistical basis in which to base scoring of a fight it appears evident that Carl Frampton’s accuracy gave him the edge in what was a close fight round by round from start to finish. It is important to remember however, that the three official judges who score fights do not have access to CompuBox statistics as they score a fight and those statistics thus do not factor into who ultimately wins a fight on the scorecards. It more often than not boils down to a judge’s own individual criteria that serves as the basis of their scoring particularly in close fights such as Santa Cruz-Frampton. As is the case with most close fights there was and likely still is some difference of opinion as to who won this fight. One thing is indisputable however, it was a great fight that will only continue to enhance reputations of not only both fighters, but also of the Premier Boxing Champions series and its commitment to bringing competitive and exciting fights to its audience. Even though it would not surprise me to see Santa Cruz and Frampton face other opposition in their next fights, it would shock me if a rematch is not in the works for at least some time in the near future. It was a great fight that is certainly deserving of an encore. Stevenson-Williams/Santa Cruz-Frampton stats and graphics provided by: ThrowdownScoring.com/CompuBox. Used with permission. For more information please visit: www.ThrowdownScoring.com.or www.ThrowdownFantasy.com . 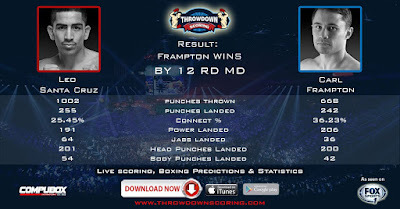 You can score live fights by downloading the free Throwdown Scoring app on Google Play or on Apple ITunes. For more information on the Premier Boxing Champions series please visit:www.PremierBoxingChampions.com.